Being laid-off has its perks. But for every perk, it has a downside. I am now itching to work and that sounds rather funny, as most people don't want to work. I have been very lucky and I am incredibly grateful. I am lucky & grateful in the sense that I was able to take the hit and be financially okay. I am thankful because there are many moments with my family that I could not have possibly shared because I was working. I have had so much time to get things done, too. After our move, things found a place and other things did not. Some things required some paint or mending...I have made such a dent in this and feel like I have accomplished something. My latest conquest: purge and organize. It seems I am not alone! 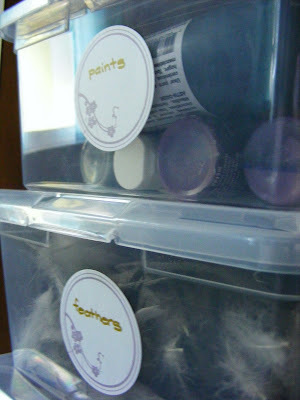 :-) I am always organizing, but I do not always purge. There are other people out there that could benefit from the things I do not use and I donated a lot. The past two days focused strictly on my studio and it got an overhaul. 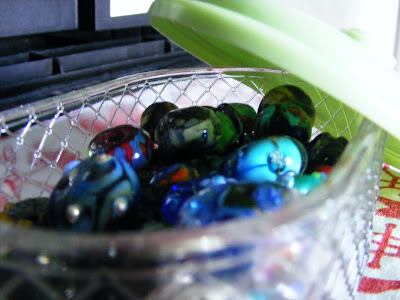 Ever find yourself not doing something because your space is cluttered or something just isn't right? That's exactly what I eliminated! And after my purge event, I can place my attention on the awesome Favorite Things Swap, hosted by Georgia at Modern Crush! Today is your last day to get your info to Georgia. To participate, please read these instructions and e-mail Georgia at: amoderncrush (at) gmail (dot) com. You do not necessarily have to have a blog to participate! I cannot believe the things I already have lined up...such a fun process! Thank you, Georgia! The Nana is coming to stay for a few days and I am off to pick her up this afternoon...we're going to eat like little piglets! I am beyond stoked to see my BFF, Lisa, next weekend...7 more sleeps! wheeee! Awesome Amy! So when I am wandering around my house, I think I am suffering from exactly what you state here. I want to eliminate it too! I am still working on that idea to steal the desk billy uses as a dresser and use it for crafting... just still haven't found him a replacement. Ugh! Yes! The swap! I am so excited too! And you are too funny... "sleeps." I haven't said that or thought about that term in a looonng time. You are awesome! Thanks for the shout-out! I fear my purging is bordering on near-manic, but it feels so good, I feel a lot lighter. Things are being delivered all over town + I'm contacting friends about items they might like. I've been reading a lot about minimizing stuff currently in one's life + avoiding future consummtion thus replacing the stuff (I'm paraprasing). I am a constant purger - constant! But I realized after reading your post (and seeing the accompanying photos) that I haven't purged my bead stash... maybe ever. I do get totally sidetracked when working on jewelry by beads I bought long ago that just don't move me anymore. 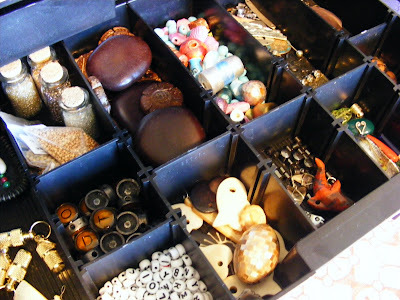 I'm inspired to clean out the "clutter" in my bead bins now. Thank you. this is a good thing!!! and you are so right!!! most with jobs (INCLUDING ME) wish we didn't have to work. but unemployment is one gigantic mindfuck! and no paycheck makes for a whole lot of stress for most!!! glad to hear you are handling things well. it is kind of cool. and i hope a job comes along at the perfect time! We got to meet Mitch and his wife before he died. We gave them a ride back to their hotel after seeing them in Raleigh. Both super cool and nice. Wish he was still cracking people up in this world. Thanks for taggin' along with me! I Love Etsy, But Who Doesn't?